Downtowners can enjoy free weekly concerts featuring contemporary Los Angeles musicians performing original music and a few surprise holiday covers during Holiday Sessions at FIGat7th. The weekly concerts kick off at 7:30 p.m. on Friday, December 4th with the soulful sounds of international jazz musician Mark de Clive-Lowe & Friends. Other headliners include Latin music sensation San Miguel Perez & The New Cuban Sound on December 11th and the sultry songstress Nia Andrews closing out the series December 18th. Several FIGat7th TASTE restaurants will feature an all night happy hour with food and drink specials. In addition to Holiday Sessions, Arts Brookfield will present A Cappella Holidays at FIGat7th, performances every Wednesday at noon in December, featuring the best a cappella groups in LA performing holiday favorites with a contemporary twist. “Brookfield is proud to bring Holiday Sessions back to FIGat7th and introduce A Cappella Holidays to Downtown LA. Our expanding free music programs provide holiday cheer to workers, residents and visitors to downtown who shop and dine at FIGat7th,” said Debra Simon, vice president and artistic director of Arts Brookfield. FIGat7th has become one of the top destinations to experience live music in downtown Los Angeles. Arts Brookfield presents Holiday Sessions as a follow-up to its critically acclaimed summer concert series FIGat7th Downtown Festival that attracted capacity crowds. Looking to extend more music experiences to Angelenos throughout the year, Arts Brookfield presents Holiday Sessions for its second year with the newly added A Cappella Holidays and will continue to present more music events in 2016. FIGat7th is Brookfield’s successful 330,000-square-foot retail and dining destination. FIGat7th is one of the only venues in Los Angeles where music lovers can dine, drink and shop in one location. To learn more about the music series and other Arts Brookfield programs, visit http://www.artsbrookfield.com. Mark de Clive-Lowe (MdCL) is one of the most innovative producers and live performers you will find anywhere. Based in Los Angeles for the past 7 years, after a decade entrenched in the cultural epicenter of London's broken beat scene, MdCL leads his live band with his party CHURCH (also the name of his latest album); performs solo live sets targeted straight for the dancefloor; educates with masterclasses and workshops; and collaborates with a broad range of artists and creatives. 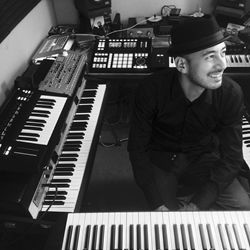 Think of MdCL like a revolutionary Quincy Jones for a now generation — melding the science of beat-making and technology with organic musicianship and tradition. Born in Granma, Cuba, San Miguel is a young, talented musician known as "El Tresero Moderno" (The Modern Tresero). Considered one of the best Cuban tres and guitar players, he is also a singer, percussionist and composer, and highly respected for his knowledge of the true identity of Cuban Music. San Miguel has been awarded with the Cubadisco 2011 for Best Tresero, and in 2014 for Best Música Tradicional Cubana. In Cuba, he was part of the great band of Adalberto Alvarez y Su Son, Jóvenes Clásicos del Son, Soneros de Verdad and The New Generation of the famous Buena Vista Social Club. San Miguel also recorded the acclaimed Latin Grammy nominated album 100 Sones of Edesio Alejandro. He now resides in Los Angeles, where he has been writing, playing and recording with Peruvian born singer-producer Cecilia Noël, and with Grammy award winning artist Colin Hay (Men at Work). He is in the final stages of the recording of his upcoming album Un Poquito de Amor Everyday, to be released this fall. Whenever LA singer/songwriter Nia Andrews steps onto the stage, the room falls into the dreamy world she paints. After touring internationally as a backup singer for the likes of Janelle Monae, Lauryn Hill and Common, singing at the Grammys for Mary J Blige and Bruno Mars, and penning vocals for underground stars like Blu, Joi Starr and Shafiq Husayn, it was a long time coming for Nia's wondrous debut EP, Colours. Since its release in 2013, she spent the last 2 years putting her heart and soul into LA's music scene, pushing it forward with her critically-acclaimed live music event CHURCH, and becoming a seminal voice at live venues around the city. No matter the setting or sound—whether singing at a wild underground party or alongside pop's heavy-hitters—one thing remains the same: Nia Andrews brings a magic like nothing else. Arts Brookfield invigorates public spaces through the presentation of free cultural experiences in Brookfield’s premier buildings around the world, located in the vibrant downtowns of Los Angeles, New York, Houston, and Denver in the U.S., Toronto in Canada, and Sydney and Perth in Australia. Since 2008, Arts Brookfield has been a leader in the downtown LA art scene. Music and art fans in Los Angeles look forward to presentations of world-class cultural experiences and signature outdoor music events at Brookfield‘s premier downtown properties. From music, theater and dance to film screenings and art exhibitions, Arts Brookfield brings public spaces to life through art. By commissioning, producing, and presenting world-class works of art, Arts Brookfield supports creativity and innovation in the fields of music, dance, theater, film, and visual art. Visit http://www.ArtsBrookfield.com for a complete schedule of events. FIGat7th, located at the intersection of Figueroa and 7th street, has become downtown LA’s premier shopping and dining destination and a major player in the revitalization of downtown Los Angeles. FIGat7th continues to announce and open the city’s most sought-after fashion retailers and chef-driven dining options in the region. Go to http://www.figat7th.com to schedule your visit.